Sometimes we say things in anger we’d like to take back. Sometimes we say things with all full intent. Such was the case in an email sent by Rep. Allen West, R-Fla., to Rep. Debbie Wasserman Schultz, D-Fla. Wasserman Schultz took to the House floor during the debate on the Cut, Cap and Balance bill, to attack West as betraying seniors by supporting the bill. The statement is targeted specifically at creating a problem for West with constituents in his district. I am bringing your actions today to our Majority Leader and Majority Whip and from this time forward, understand that I shall defend myself forthright against your heinous characterless behavior…which dates back to the disgusting protest you ordered at my campaign hqs, October 2010 in Deerfield Beach. West’s email clearly depicted his anger towards Ms. Wasserman Schultz, but nowhere in the email did he state anything other than his personal opinion about Schultz’s behavior. West didn’t take to the podium and lash out against Ms. Schultz, but rather expressed his resentment in a personal communication to Ms. Schultz and copied the email to the House Majority Leader, the House Minority Leader, his Chief of Staff and the House Majority Whip. Agree or disagree, Congressman West had the right to express his feelings to Ms. Schultz. It’s not a surprise that many of her Democrat House associates have come to her defense, and no one should be either shocked or offended by her compatriots being supportive of the Congresswoman; but somewhere loyalty has jumped from reasonable to crazy. Rep. Mike Honda, D-Calif., released a statement about Rep. West likening him to Pastor Terry Jones who torched the Koran in March. Apparently Ms. Wasserman Schultz’s attack on the House floor is akin to a holy book. In the Democrat world despicable attacks against Republicans in a public forum is tantamount to words of the almighty. Honda’s statement is one of more than a dozen Democrats that have taken to the podium and media to decry West’s email demanding an apology and a reprimand from the Republican Leadership; but neither West nor the house leadership is budging one inch. Majority Leader Cantor and Speaker Boehner have kept quiet about Rep. West’s email, offering neither support nor condemnation. West has made it clear; he will neither apologize nor back down from the comments in his email. 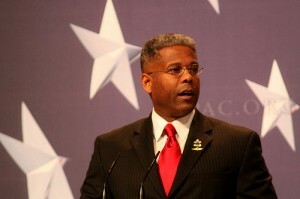 Rep. Allen West is a hero by all measures. Asking a man of his makeup to sit back while a politician, who just happens to be the DNC Chairwoman, personally attack him masquerading as concern for the senior citizens in West’s district is ludicrous. Whether Wasserman Shultz’s partisan attempt to execute a flanking maneuver against West qualifies as unladylike is something each person will have to judge for themselves. Nonetheless, Rep. West has the right to voice his opinion of Ms. Wasserman Schultz’s behavior and she is free to fire back an email telling West where to park it; but that’s not the Liberal way. Following the Saul Alinsky handbook, West served up a softball and the Liberals won’t pass up an opportunity to demonize him. It’s time we all get behind Rep. West whether we agree with his tactics or not, otherwise everyone’s freedom to voice their opinions is diminished. Worst of all, demonizing a man that has given 22 years of his life to defend Wasserman Shultz’s right to stroll up to the well of the House and fling out vile, unprofessional and despicable words should offend us all.